Card games to play alone, or solitaire games, can usually be played with a single deck of cards. In recent years, they have also appeared as computer software programs and apps for cell phones, providing office workers a nice break and travelers a handy source of entertainment. There are hundreds of different variations, but a few staples stand out. Klondike is the most popular solo card game in the world and many people consider it synonymous with the word "solitaire." Shuffle the deck and deal seven stacks of cards: one card in the left-hand stack, two in the stack to its right, three in the next and so on. Turn over the top card in each stack. Draw three cards from the deck and turn them face-up. 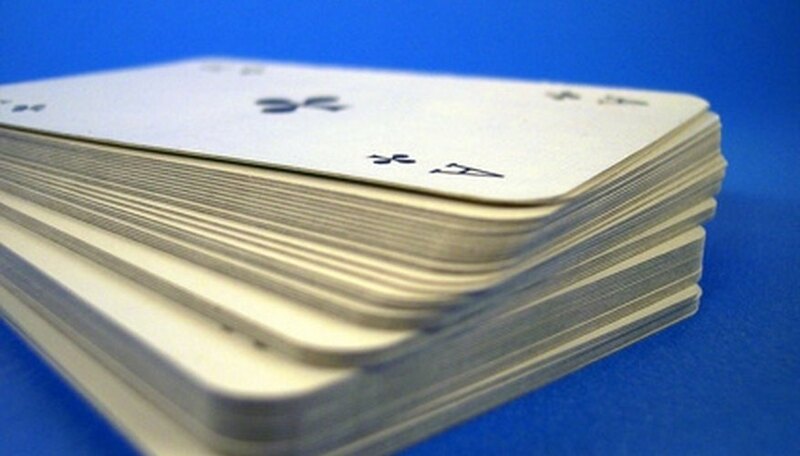 Play the nearest card to you on top of any face-up card that is one number higher and opposite in color. Set it slightly down from the face-up card so that you can see what every face-up card is. For example, the seven of clubs may be placed on the eight of hearts. The topmost face-up card on any stack can be moved to another face-up card according to the same rules. To take the earlier example, the eight of hearts may be placed on the nine of spades. Face-up aces may be removed to form a series of four new columns above the seven stacks. If an ace has been laid there, you can place the two of the same suit on top of it. The object is to fill those columns with the entire deck in order, from the ace of each suit to the king. To play Golf, deal seven rows of five face-up cards. Spread each row slightly so that you can see each card, then deal one card below them all--face up--to form a new column, and set the remainder of the deck aside as a stock pile. You may place any card ranked one higher or one lower on top of it. For instance, if the tableau card is the four of clubs, you may place any three card or any five card on top of it. You cannot play any card on top of a king. That card must come from the bottom of one of the seven rows. Continue placing cards in this manner until you can no longer do so. You may then turn over the topmost card in the stock pile and place it in the tableau if you can. The object is to remove as many cards as possible from the seven rows. The fewer the card count, the better the game--hence the name Golf.